Breathtaking mismanagement of the economy, a hugely unpopular president, massive demonstrations on the streets, an annual inflation rate estimated in the millions, and now world leaders queuing up to recognise the opposition leader as the interim president pending elections. Surely this potent mix must signal the end of the so-called Bolivarian Revolution that began two decades ago with the election as president of the late Hugo Chávez? Perhaps. But those who have followed events over the last twenty years might be tempted to describe the situation in Venezuela as one of the most stable crises in modern history. I remember many other moments when everyone was certain that the end was nigh for the Chavistas. Like April 2002, when Hugo Chávez was briefly removed from power, only to be re-installed amid massive demonstrations by his supporters; or like 2014, when a wave of anti-government protests left over 40 dead and almost 2,000 arrested; or like 2015, when the ruling party and Chávez’s successor, Nicolás Maduro, lost control of the legislature by a landslide and impeachment seemed certain, only for the government to push everything down a legal quagmire; or like last year, when a new wave of anti-Maduro demonstrations, sparked by severe food shortages, shortage of medicines and hyperinflation, left over 160 people dead and thousands injured or arrested. On each occasion, it seemed that the game was finally up for Bolivarianism, the shifting mix of anti-imperialist and left-wing ideas named after a nineteenth-century liberator from Spanish rule. But each time, Chávez, and then Maduro, survived. Maduro saw the crisis through with a series of clever manoeuvres. In 2017, he pushed forward a new Constitutional Assembly – a supra-national body that could overrule any state power, composed mostly of his allies. In 2018, he brought forward presidential elections, which he won after most opposition candidates had been banned or imprisoned. The company that ran the software for the electronic voting claimed after the result that “at least a million votes” had been manipulated by the electoral authorities – all appointed by a Supreme Court controlled by the ruling party. In the last two years at least three million people have left the country, fleeing the catastrophic economic collapse. Washington imposed sanctions against some officials in 2014 for what it deemed gross human rights abuses against opposition demonstrators (claims backed by the UN and the EU), but tampering with election results has led the US to increase the pressure on Maduro. More sanctions against officials, and now – finally – against the national oil company (the country’s main source of income) have followed. But could dialogue be the answer? Pope Francis said last week he was “fearful of a bloodbath” and has called for a “just and peaceful” solution to the crisis. On Monday, the Vatican confirmed that Maduro had sent a letter to Pope Francis asking for “a dialogue”. But in a country where it is estimated that the economy has shrunk in half in five years, that 87 per cent of the population has now fallen into extreme poverty (it was 48 per cent in 2014) and that at least 64 per cent of the population has lost weight due to the shortage of food, there may not be a great appetite for dialogue among those bearing the brunt of the crisis. The Catholic Church has been involved before in attempts to deal with the numerous crises faced by the governments of Chávez and Maduro, the latest in 2016-17. That led nowhere and only caused further schism within the ranks of the opposition. The relationship between the leaders of the Bolivarian Revolution and the Catholic Church over the last twenty years is as full of eccentric characters and colourful anecdotes as any Latin American telenovela. Chávez sought to transform the whole structure of the Venezuelan state as soon as he was elected in 1999. One of his first moves was to push for a law that would reduce the formal position of the Catholic Church in a traditionally Catholic country. He attempted to accelerate the growth of evangelical denominations by giving them “public recognition”, which alarmed Church leaders. Chávez regularly spoke of his personal belief in Jesus, who he called a “revolutionary” like himself. Chávez was close to some members of the clergy, but openly critical (in robust Chávez style) of the bishops. Some of them, he said, had “the devil hidden underneath their robes”. He once declared himself a Protestant evangelical in a dig against the Church, only to histrionically backpedal later. As he fell ill (he died of cancer in 2012) he spoke more and more of his Catholic faith. The more leaden-footed Maduro tries to mirror Chávez’s political style. He even tries to mimic his mannerisms and his tone of voice at public events. He also has kept the same hostile tone when referring to the bishops, who he has accused of being part of a US-led plot that seeks to topple him. 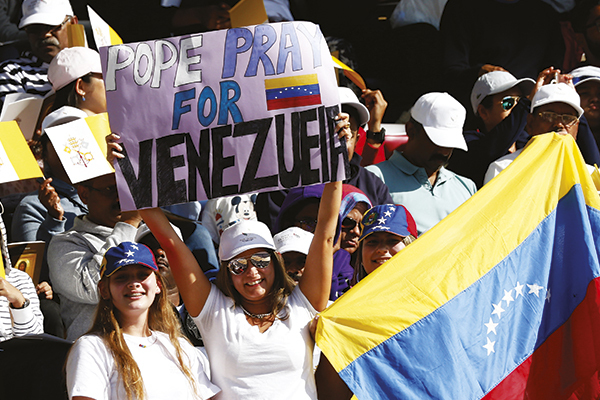 Jorge Liberato Urosa Savino, who retired as Archbishop of Caracas in July last year, said last week that he would like to see Maduro step down. A key figure in the current crisis is a young politician who rose through the ranks of his party and was one of the students who joined the anti-government protests of recent years. In early January, the National Assembly labelled Maduro an illegitimate “usurper”, and on 23 January, Juan Guaidó, the leader of the assembly, was sworn in as interim president. On Monday, the UK foreign secretary, Jeremy Hunt, acknowledged Guaidó as “interim constitutional president until credible elections can be held”. Six other European Union countries – including France and Germany – have also recognized Guaidó as the legitimate leader of Venezuela, after Maduro had ignored their demand to schedule a new presidential election. Maduro is still being backed by regional allies such as Mexico and Bolivia, but more crucially by Russia and China, two countries to which Venezuela is heavily in debt. Guaidó is calling for the demonstrations against the Maduro government to continue, asking the military to intervene and seeking humanitarian aid from the US to border crossing points out of the country. Venezuela’s Supreme Court has banned Guaidó from leaving the country and frozen his bank accounts. It is not easy to see how “credible elections” could be held any time soon. The electoral authorities are widely discredited, as is the system used to facilitate electronic voting, especially since the company that ran the software fled the country in the days following Maduro’s re-election last year. No independent international observers are invited in to observe elections. The electoral authorities’ terms ran out a few years ago, but the government has refused to let the opposition-led National Assembly appoint successors. In the meantime, the military hierarchy is committed to Maduro, or at least that’s what it seems, and despite incessant rumours (Venezuela’s national sport) to the contrary, there is no clear indication that a coup is on its way. Although the US has increased its rhetoric since the start of 2019, with Donald Trump warning that “all options are on the table”, it has distanced itself from military intervention. This leaves social pressure and discontent as the main instrument of political pressure for the Guaidó-led opposition. Vladimir Hernandez is a BBC journalist who has been working in Latin America for over 15 years.